Create a grid approximately 15X15. Evenly split the team into 2 teams (red and yellow). Place the red team on one corner of the grid and the yellow team on the opposite corner of the grid. The first player from each line will play 1v1 against each other. The coach should have all the balls on the side of the field. 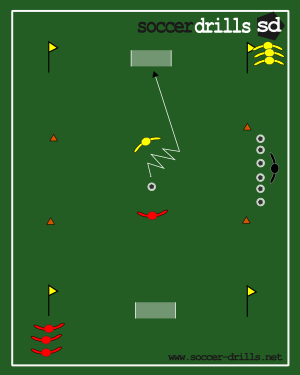 The coach will start by playing a ball into the middle of the field for a 50-50 ball, or directly to one of the two front players. If the ball is played out of the grid or a goal is scored the ball is dead and it is the next players from each lines turn to play.